DELACROIX, La. – The rod more than doubled and the reel’s drag screamed but the braided line held its own as the first fish of the day showed its mettle all the way to the net. Others quickly followed until ice chests approached capacity, filled with groceries the marsh seemed more than willing to provide. 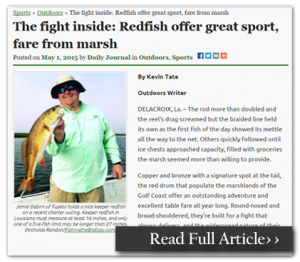 Copper and bronze with a signature spot at the tail, the red drum that populate the marshlands of the Gulf Coast offer an outstanding adventure and excellent table fare all year long. Round-nosed and broad-shouldered, they’re built for a fight that always delivers, and the widespread nature of their population offers an accessibility that’s hard for any other saltwater species to match.